Key difference: Yoghurt and curd are two different types of dairy products. These two are two different forms of milk that are created by fermenting milk in some way. Yogurt is a diary product that is created by fermenting milk using bacteria. The bacteria that is used to ferment milk is known as ‘yogurt cultures’. Curd is a dairy product obtained by curdling with an edible acidic substance such as lemon juice or vinegar, and then draining off the liquid portion. However, in India the term curd is often used for yogurt/dahi. Yoghurt and curd are two different types of dairy products. These two are two different forms of milk that are created by fermenting milk in some way. Yoghurt and curd play an important part in cooking and diet in many different cultures around the world. These are completely different from each other in almost every aspect. Yogurt is a diary product that is created by fermenting milk using bacteria. The bacteria that is used to ferment milk is known as ‘yogurt cultures’. The bacteria ferment the lactose in the milk causing it to produce lactic acid, which gives yogurt is tangy and acidic taste. Yogurt has been dated back to India and Iran circa 500 B.C. In India, yogurt and honey are known as "the food of the gods" and are a part of festivals and offerings. The word ‘yogurt’ is derived from the Turkish word, ‘yoğurt’, which means “to curdle or coagulated; to thicken” Yogurt is also spelled in various other ways such as yoghurt, yoghourt, yogourt, yaghourt, yahourth, yoghurd, joghourt, and jogourt. Yogurt is most commonly created using cow’s milk; however it can also be created using water buffalo, goats, ewes, mares, camels, and yaks. 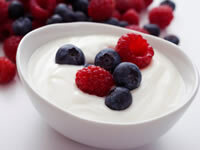 In order to create yogurt, bacteria such as Lactobacillus delbrueckii subsp. bulgaricus and Streptococcus salivarius subsp. thermophilus bacteria culture are used. To create yogurt, the milk is first heated to about 80 °C in order to kill any additional bacteria that may be present and to denature milk proteins. The milk is then left to cool to around 45 °C, the bacteria is then added (when bacteria is not present, a spoonful of yogurt will also do the trick), the milk is then left to ferment at room temperature. The yogurt can be consumed raw, or flavored with sugar, salt, spices and any other flavors. Yogurt is also very healthy as a part of daily diet. It is a good source of calcium, phosphorus, riboflavin-vitamin B2, iodine, vitamin B12, pantothenic acid-vitamin B5, zinc, potassium, protein and molybdenum. Yogurt is also high in probiotics that can help a person live longer. The bacteria can also help boost the immune system. People who have allergies to dairy products are advised to consume yogurt as it does not produce the allergy that is caused by lactose. Yogurt is also a good option for people who suffer from stomach ailments, such as diarrhea. Consumption of low-fat yogurt can also aid in weight loss. Curds are another type of dairy product. Curds are made by curdling or coagulating the milk. This can be done by mixing edible acidic substances in to the milk, such as lemon juice or vinegar. Introducing these substance to the milk, will allow the milk to curdle and separate into two parts. The liquid part is the whey and the milk solids will be the curds. The whey contains the whey proteins of the milk, whereas the curds are the milk proteins or casein. Sometimes old milk might sour and separate without the added acidic substances. Once the curds are separated, they may be eaten as is, or flavored with sugar, salt, spices and any other flavors, or it may be further processed into cottage cheese, quark and /or Indian paneer. Curds can be made from cow, water buffalo, sheep/ewe, yak, reindeer, llama, camel, and goat's milk. A type of curd in Spain is made from ewe's milk. Curd is nutritious. According to Livestrong, “Four ounces of fresh cottage cheese or curd contains: 111 calories; 13 g protein, 5 g fat and 3 g carbohydrate in the form of lactose. It also contains measurable amounts of vitamins A, E and K; thiamine, riboflavin, niacin, pantothenic acid, vitamin B6, folate and vitamin B12. It also contains calcium, iron, magnesium, phosphorus, potassium, sodium, zinc, copper, manganese, fluoride and selenium, as well as saturated fats, and oleic acid, which is a monounsaturated fat.” Curds also have a healthy content of probiotics. However, some claim that curds have a high content of protein, which may acidity the blood. In order to nullify this acid, the body seeps calcium from the bones and releases it into the blood. Over time and excessive acid in the blood may increase chances of osteoporosis. In South Asia, the term curd refers to yogurt. Sometimes the term may even refer to non dairy products that appear to have a texture similar to the dairy curd. These include curds made from soy milk, as well as curdled eggs, bean curds and lemon curds. Yogurt is a dairy product that is created by bacterial fermentation of milk using ‘yogurt cultures’. The bacteria causes fermentation of lactose and produce lactic acid. Curd is a dairy product obtained by curdling with an edible acidic substance such as lemon juice or vinegar, and then draining off the liquid portion. Cow, water buffalo, goats, ewes, mares, camels, and yaks. Cow, water buffalo, sheep/ewe, yak, reindeer, llama, ewe, camel, and goat's milk. The oldest dated records show yogurt being used in the ancient culture of India and Iran as far as 500 B.C. Probably first discovered accidentally as old milk curdled. Yogurt is a good source of calcium, phosphorus, riboflavin-vitamin B2, iodine, vitamin B12, pantothenic acid-vitamin B5, zinc, potassium, protein and molybdenum. Yogurt is also high in probiotics that can help a person live longer. The bacteria can also help boost the immune system. Curd is nutritious. 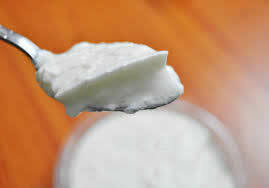 Four ounces of fresh cottage cheese or curd contains: 111 calories; 13 gram protein, 5 gram fat and 3 gram carbohydrates. Also contains amounts of vitamins A, E and K; thiamine, riboflavin, niacin, pantothenic acid, vitamin B6, folate, vitamin B12, calcium, iron, magnesium, phosphorus, potassium, sodium, zinc, copper, manganese, fluoride, selenium saturated fats, and oleic acid. Also high in probiotics. The lactic acid produced by the ‘yogurt cultures’ bacteria might cause a tangy, acidic taste to the yogurt. Curd tastes slightly more tangy or sour than yogurt. May squeak against teeth while eating. Yogurt can be eaten just like that or it can be salted or sweetened. Additional flavors can also be added to the yogurt. Yogurt is also used as a replacement for heavy cream in many recipes. It is also useful in creating other beverages such as the Indian lassi or chaas. Curd can be eaten just like that or it can be salted or sweetened. It is most often used in desserts or served in sandwiches or salads. The writer of the article has no idea what curd is. Lemon juice or vinegar would give cottage cheese and paneer, not curd. Curd or dahi is also a fermented product. Do your homework before you post articles with ignorance. Oh man!!! That's paneer but not curd! Dahi which we make in our house is curd or yoghurt? In making shawarma or vegetable or sandwich or pita sauce or dips can I substitute yogurt for curd or curd for yogurt? yogurt.curd.paneer.all are good source of minerals,vitamins,carbohydrates and fats.understand in easy terms. then useful..
"NAAM MEIN KYA RAKHA HAI SAHAB" It doesn't matter about how they are being called all over the world.But one thing is for sure, we have got two different things to try so try and enjoy.